Last week, Ithaka S+R published results from the US Library Survey 2016. This report examines the perspectives of library deans and directors on strategy and priorities broadly. This cycle, we expanded our coverage of issues related to talent management, building on recent Ithaka S+R projects on organizational structure and inclusion, diversity, and equity. Employees are often the greatest asset of an organization, and therefore, a mindset to recruit, develop, and retain an outstanding pool of employees can contribute mightily to organizational vitality. Results from this survey, like previous survey cycles, provide the perspective of library leaders, and it is worth emphasizing that on these issues in particular theirs is but one perspective. Even so, there is quite a bit to reflect upon coming out of our findings. In particular, research library directors see talent management issues quite a bit differently than do their smaller institution peers. 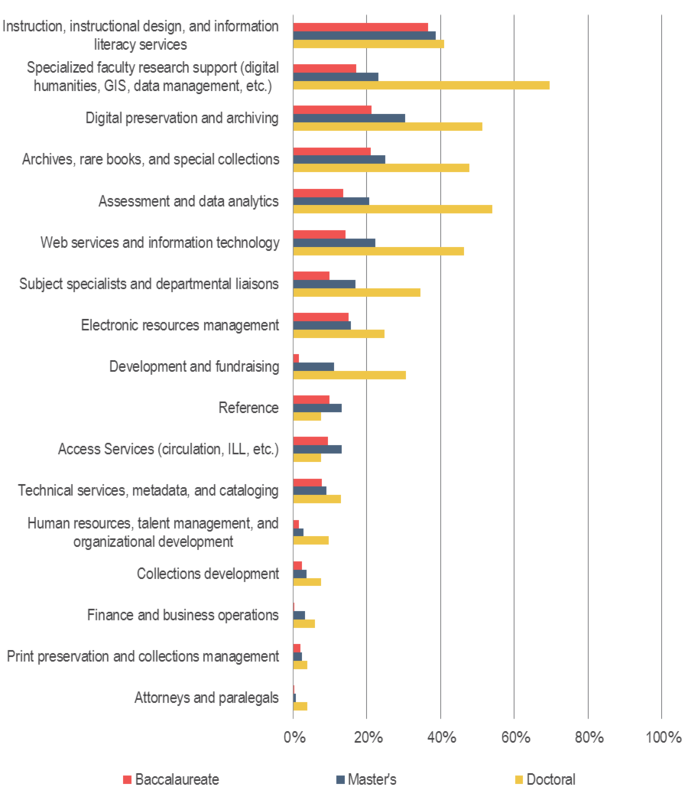 While nearly all library directors are seeking to invest in student learning, research library directors are more clearly pursuing a major pivot, shifting their general collections staffing towards distinctive collections and specialized research support services. This pattern can be seen clearly in the areas where library directors from different types of institutions are planning to add and reduce staff. Research library directors are especially interested in adding positions that will provide new research support services and support distinctive collections, as the figure below illustrates. Figure 1: To the best of your knowledge, will your library add or reduce employee positions in any of the following areas over the next 5 years? Percentage of respondents who indicated that they would add employee positions in each of the following areas. To support this new direction, directors at doctoral universities are especially interested in adding new staff and redefining existing positions; approximately seven in ten survey respondents from doctoral institutions indicated that they would be interested in this investment, compared to roughly half of respondents at Master’s and Baccalaureate institutions. And while directors from all three institution types are equally interested in employee salary increases, doctoral institution directors are notably less likely than their peers to wish to make additional investment in employee travel and professional development. Moreover, we also see in the survey findings that relatively greater shares of respondents at doctoral institutions believe that they currently offer effective leadership training, and relatively smaller shares believe that they have insufficient funding for training and professional development. 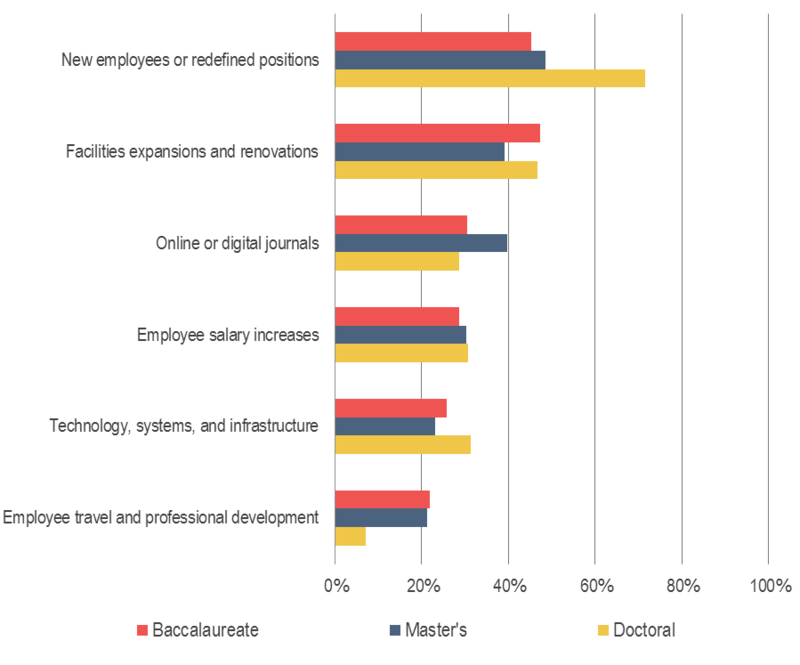 While we must be cautious in reaching any conclusion here broadly, there does seem to be at least some evidence that doctoral directors are more likely than their peers at other institution types to be interested in making additional investments in re-staffing and are relatively less interested in devoting additional resources towards reskilling. Figure 2: If you received a 10% increase in your library’s budget next year in addition to the funds you already expect to receive, in which of the following areas would you allocate the money? Percentage of respondents who selected each item. About 40% of respondents agreed that retaining current high performing employees is a substantial challenge for their library, and this presented as a somewhat larger concern at doctoral institutions than at smaller colleges and universities. Failing to retain top performers can substantially affect one’s ability to make staffing decisions, including those related to effectively identifying and investing in these high performers, developing succession plans, and planning for areas of future investment. Those respondents who identified this challenge are more likely than others to think that lack of compensation or limited opportunities for career advancement are important factors underlying voluntary employee departures. While library leaders may often feel that they have limited influence to be able to impact these considerations, which are often shaped at least to a large degree by institutional human resources policies rather than by those inside the library, it may be that libraries with a retention issue should be advocating for improved compensation and career paths. Figure 3: What are the top reasons library employees voluntarily leave your college or university? Percentage of respondents who selected each item. At the same time, there is real evidence that many libraries may not be taking an especially formal approach to talent management. 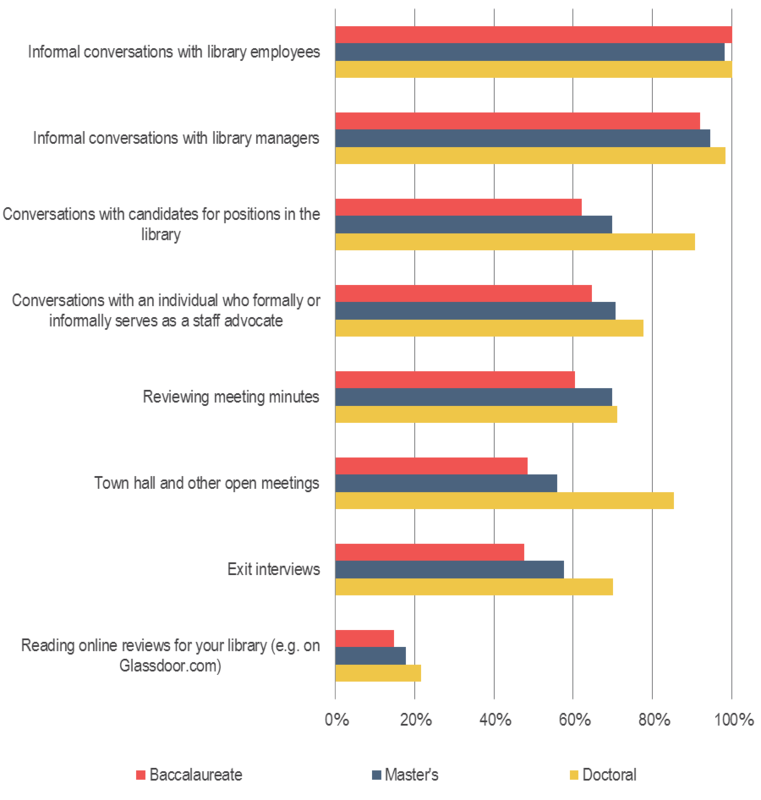 For example, library leaders much more frequently utilize informal conversations as a mechanism to stay informed about employee morale compared to the use of staff advocates, exit interviews, or online reviews. Figure 4: How often do you employ the following tactics to stay regularly informed on how staff feel about working in your library? Percentage of respondents who often or occasionally employ the following tactics. Leaders’ prioritization of talent management is generally a prerequisite not only for improving inclusion, diversity, and equity, but for effectively leading an organization undergoing strategic transformation. The findings of our newest study suggest that while some leaders may be truly committed to a talent mindset, others may not be pulling out all the stops to focus on talent acquisition, development, and retention. Especially in a period of strategic transformation, these are among the most important issues for organizational effectiveness.